Scarlet Wrap Handcrafted Varanasi Silk Shawl India, "Woman in Red"
Woven by hand on a traditional pit loom, this elegant shawl is the work of Madhu Agrawal. She works in shimmering red, creating the wrap with Varanasi silk, which originated in the town of Banaras. 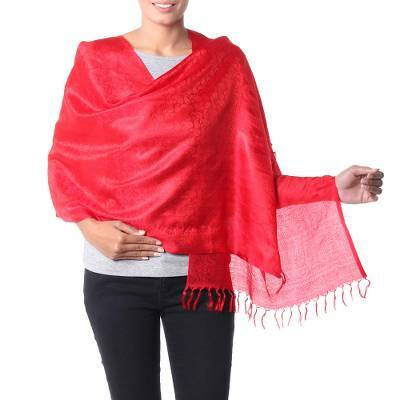 You can find varanasi silk shawl 'Woman in Red' by Madhu Agrawal in accessories categories such as Paisley Shawls, Bollywood Shawls and Silk Shawls. Enjoy exploring these sections for other Novica treasures.